In a frying pan add a splash of olive oil and the butter and melt. Add the onion and soften until translucent (4-5 minutes). When softened remove from the heat and allow to cool to room temp. Deglaze the pan with the cognac and cook for 30 seconds then add to the onions. In a dry pan toast the fennel seeds for 1-2 minutes on a medium – low heat until they start to release their aromas. Remove from heat and using a spice blender or pestle and mortar grind until powder. In a food processor blitz the chicken breast until minced well. In a large mixing bowl add the chicken, pork mince, cherries, onion/cognac, fennel seeds, parsley, pistachios, and season well with salt and pepper. Mix well so everything is combined equally using your hands. Line the bottom of a 900g loaf tin with a piece of greaseproof paper. Then line the tin with the bacon so half the bacon is in the tin and the other half other hanging as you will need to wrap this over the top to make sure the top of the terrine is covered. 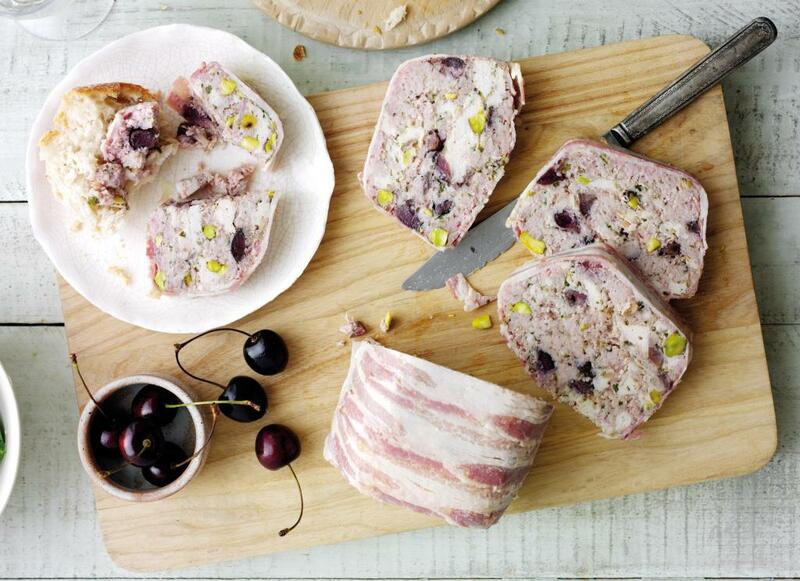 Once the tin is lined with the bacon add the terrine mixture then fold over the bacon to seal the top of the terrine. Then cover with a piece of greased foil. Boil a kettle. Place the terrine tin into a roasting tin, and then fill the tray with boiling water so it comes up the terrine tin half way and place into the oven to cook for 1 hour or just over so its cooked all the way through and juices run clear when pierced in the centre with a knife. When cooked remove from the oven and take the terrine tin out of the roasting tray and allow to cool to room temperature. Chill well, overnight if you have time, before removing from mould, peeling off the lining paper and slicing. Serve with crusty bread and dressed salad leaves (optional).